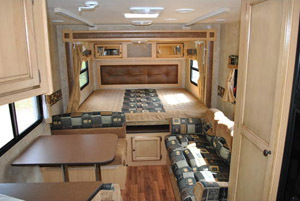 Ever wish you could camp in an RV without having to own one? Perhaps you just really don’t want to pull yours to the mountains? No problem, renting one from us is quick and easy! 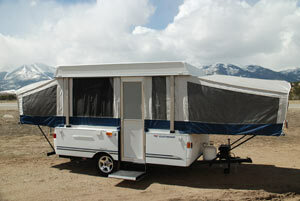 Snowy Peaks offers rental of late-model recreational pop up campers and travel trailers for you to explore Colorado's great outdoors either from our park or anywhere else on your own - or have us deliver and pickup anywhere in Colorado! 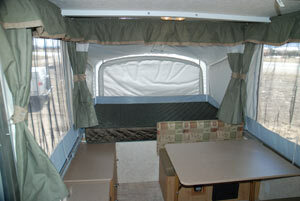 Clean & roomy inside. Easy to tow. Sleeps 6 people. 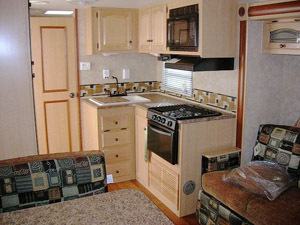 Equipped with refrigerator, sink, stove, dinette, and furnace. Fully self contained. Very comfortable and clean. Sleeps 4-6 people. 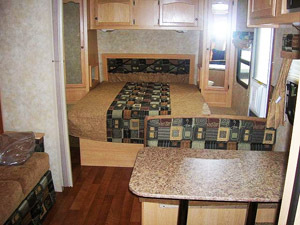 Equipped with refrigerator, stove, oven, microwave, full bathroom including shower, air conditioning, and furnace. Don't Have a Way to Pull a Trailer or Don't Want To? We Can Deliver! Delivery and pick-up is available to anywhere in Colorado, subject to available personnel. Cost is $2.75/loaded mile (one round trip); $75 minimum charge. This includes delivery, set-up, take-down and return. A surcharge may apply on unimproved roads. Please schedule your departure between 1:00 pm and 5:00 pm and return between 8:30 am and 11:00 am any day of the week. Other arrangements can be made with adequate notice. Plan about one hour for check-out and hook-up. All reservations are on a "first come, first served" basis. A $250 Reservation Deposit is required to reserve the unit. The balance of the cost is due on first day of rental. Cancellation of rental within 1 month of departure date forfeits this deposit. Beyond 1 month a $25 service fee will be applied. Rescheduling, based on availability, is acceptable with a minimum two week notice. You will be charged an additional $25/hour and/or $150/day for late returns. We carry damage insurance but you are responsible for checking with your insurance company to see if you are covered for liability when towing a trailer. It is the driver's responsibility to operate all trailers in a safe manner at all times. Any person who will be driving the vehicle that pulls one of our trailers must provide proof of a valid driver's license, proof of insurance and must be 25 years of age or older. Should a breakdown of rental unit occur, we will reimburse expenses under $50 with a receipt showing proof of payment. All expenses over $50 require prior permission before proceeding with the repair. You are responsible for campground fees, propane usage and disposal of waste water. A $25 service fee will assessed if waste tanks are not completely empty. Snowy Peak’s dump station may be used free of charge. The propane tanks will be full at departure and refilled on return.